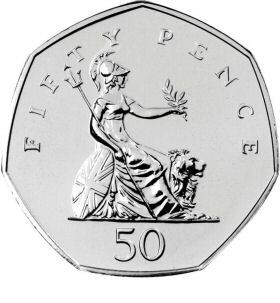 The 50p coins currently in circulation are dated from 1997 on, when the new smaller and lighter coin was produced. 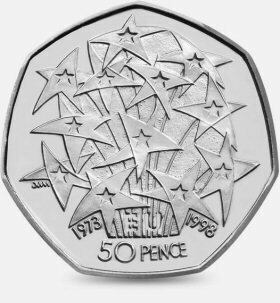 There were 4 designs released prior to 1997 which are no longer in circulation. 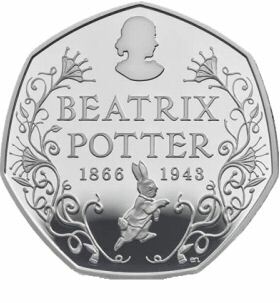 There have been a number of special issue sets of 50 pence coins in recent years including the 29 Olympic 50p coins created for London 2012 and the 5 Beatrix Potter 50p coins that make up the set marking the 150th anniversary of Beatrix Potters birth. 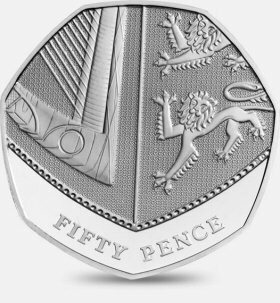 Commemorative 50p coins featured here can be ordered direct from The Royal Mint which includes Beatrix Potter 50p Coins. 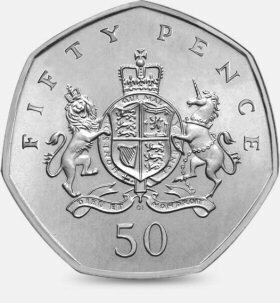 If you have some old 50p coins or new presentation folders, you could sell your coin collection online with a new service provided by Coin Hunter and associated coin dealers across the UK. 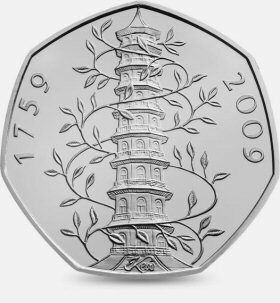 The 2009 Kew Gardens design is very rare, around 1 in 15007 50 pence coins have this design. 210,000 coins dated 2009 entered circulation. 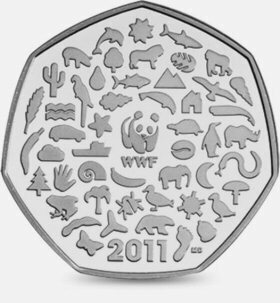 The 2011 WWF design is very uncommon, around 1 in 909 50 pence coins have this design. 3,400,000 coins dated 2011 entered circulation. 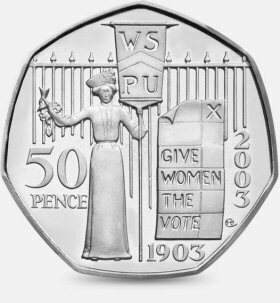 The 2003 Womens Social and Political Union design is very uncommon, around 1 in 772 50 pence coins have this design. 3,124,030 coins dated 2003 entered circulation. 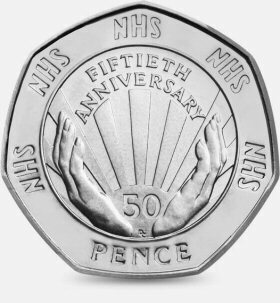 The 1998 NHS design is very uncommon, around 1 in 567 50 pence coins have this design. 5,001,000 coins dated 1998 entered circulation. The 1998 European Union design is very uncommon, around 1 in 562 50 pence coins have this design. 5,043,000 coins dated 1998 entered circulation. 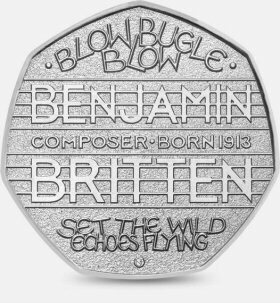 The 2013 Benjamin Britten design is uncommon, around 1 in 428 50 pence coins have this design. 5,300,000 coins dated 2013 entered circulation. 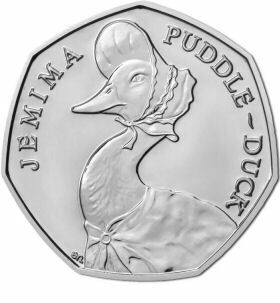 The Beatrix Potter Jemima Puddle-Duck design is uncommon, around 1 in 393 50 pence coins have this design. 2,100,000 coins dated 2016 entered circulation. 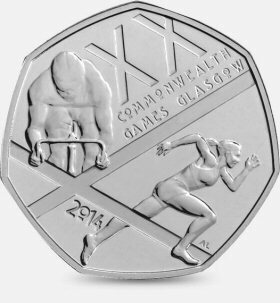 The 2014 Commonwealth Games design is not easy to find, around 1 in 235 50 pence coins have this design. 6,500,000 coins dated 2014 entered circulation. 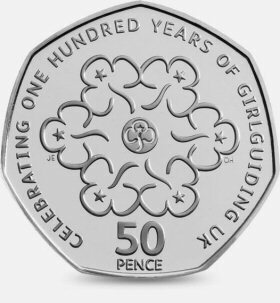 The 2010 Girlguiding design is not easy to find, around 1 in 230 50 pence coins have this design. 7,410,090 coins dated 2010 entered circulation. 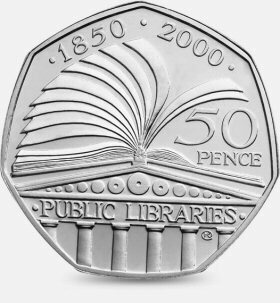 The 2000 Public Libraries design is quite available, around 1 in 179 50 pence coins have this design. 11,263,000 coins dated 2000 entered circulation. 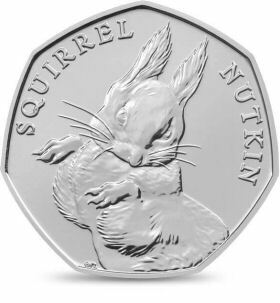 The Beatrix Potter Squirrel Nutkin design is quite available, around 1 in 165 50 pence coins have this design. 5,000,000 coins dated 2016 entered circulation. 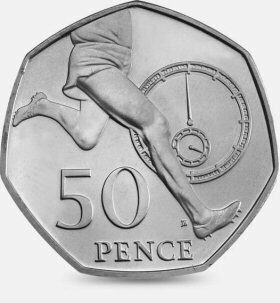 The 2004 Roger Bannister design is quite available, around 1 in 159 50 pence coins have this design. 9,032,500 coins dated 2004 entered circulation. 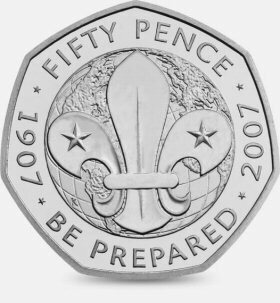 The 2007 Scouting design is quite available, around 1 in 155 50 pence coins have this design. 7,710,750 coins dated 2007 entered circulation. 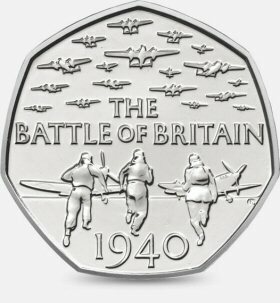 The 2015 Battle of Britain design is quite available, around 1 in 148 50 pence coins have this design. 5,900,000 coins dated 2015 entered circulation. The 2013 Christopher Ironside design is quite available, around 1 in 147 50 pence coins have this design. 7,000,000 coins dated 2013 entered circulation. 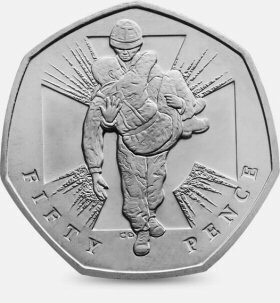 The 2006 Soldier design is quite available, around 1 in 143 50 pence coins have this design. 10,000,500 coins dated 2006 entered circulation. 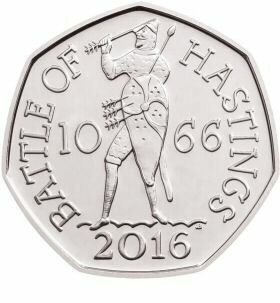 The Battle of Hastings design is quite available, around 1 in 112 50 pence coins have this design. 6,700,000 coins dated 2016 entered circulation. 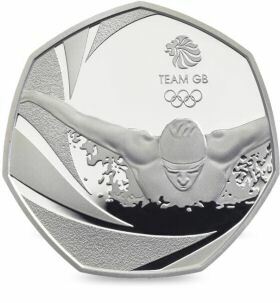 The Team GB design is quite available, around 1 in 108 50 pence coins have this design. 6,400,000 coins dated 2016 entered circulation. The Beatrix Potter Anniversary design is quite available, around 1 in 107 50 pence coins have this design. 6,900,000 coins dated 2016 entered circulation. 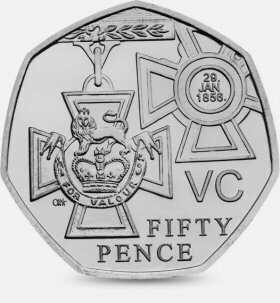 The 2006 Victoria Cross design is quite available, around 1 in 105 50 pence coins have this design. 12,087,000 coins dated 2006 entered circulation. 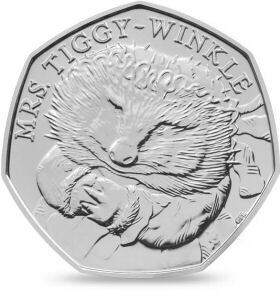 The Beatrix Potter Mrs Tiggy-Winkle design is quite available, around 1 in 90 50 pence coins have this design. 8,800,000 coins dated 2016 entered circulation. 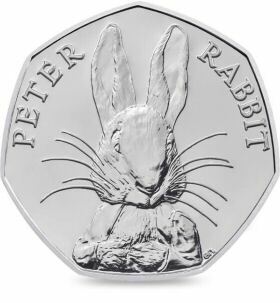 The Beatrix Potter Peter Rabbit design is quite available, around 1 in 86 50 pence coins have this design. 9,600,000 coins dated 2016 entered circulation. 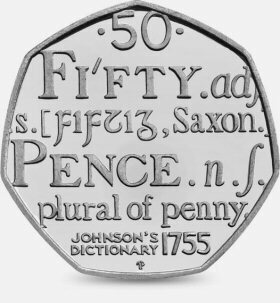 The 2005 Samuel Johnsons Dictionary design is quite available, around 1 in 53 50 pence coins have this design. 17,649,000 coins dated 2005 entered circulation. The Shield of the Royal Arms design is very common, around 1 in 5 50 pence coins have this design. 134,450,030 coins dated 2008 - 2015 entered circulation. The Britannia - revised inscription design is very common, around 1 in 2 50 pence coins have this design. 869,433,107 coins dated 1982 - 2008 entered circulation.